When it comes to figuring out which host to pick, many people only consider plans, prices, and reviews. However, another consideration that’s often overlooked is which software each host uses. This factor is important since it will profoundly impact how you interact with your provider. As a customer, you’ll want to go with an option that is both powerful and easy to use, and that’s where cPanel comes in. This platform isn’t the only option available, but it’s one of the most popular ones thanks to its ease of use and broad range of features. In this article, we’ll introduce you to what cPanel is and what it does. By the end, you’ll know why this software is so popular among web hosting providers (and why you should care). Let’s get started! cPanel is a control panel application that can be installed on any server. To put it simply, it enables you to execute all the actions on a server you might need to, using a simple interface instead of a command line. It’s important not to confuse software like this with an Operating System (OS). Each server still needs an OS to function, and if you want to use cPanel, you’ll need a Linux distribution to set it up. The software itself was created for a Texas-based web hosting company in the 1990s. It changed hands over the years, while being updated and improved. cPanel is now owned and distributed by the company of the same name. It wasn’t until 2002 that the software really began to take off, but since then it has become hugely popular. When it was first conceptualized, there was little competition in the field of hosting software, but cPanel quickly made a name for itself thanks to its ease of use and breadth of features. There isn’t any public data as to how many hosting providers use cPanel these days. However, if you’ve tried hosting a site of your own, chances are you’ll run across multiple web hosts that use it, including us. We’ve even added a few features to the traditional cPanel, such as our A2 Hosting WordPress optimized installations. cPanel offers dozens of powerful features that you can take advantage of. For now, let’s focus on three of the most critical. All in all, cPanel enables you to interact with your server’s files in any way you see fit, and it includes tools with multiple levels of complexity. That means even advanced users can benefit from it. We’ve talked about backups before, but we never get tired of highlighting just how important they are. A recent backup of your site can save you if you run into an error, if you happen to delete an important file by mistake, and even if your website gets attacked. Naturally, manual backups tend to provide you with more options, such as handpicking which elements you want to save. However, it’s up to you to choose which tool to use, just as long as you remember to back up regularly! Some hosts even include a ‘server rewind‘ feature in their cPanels (we’re one of them). This functionality enables you to roll back your entire server to an earlier snapshot (usually taken automatically) in case you need to backtrack. Databases are crucial when it comes to keeping your website running. They store most of your site’s data, including valuable information such as passwords, usernames, emails, and so on. Each of these tools gives you a different way to create and manage databases. 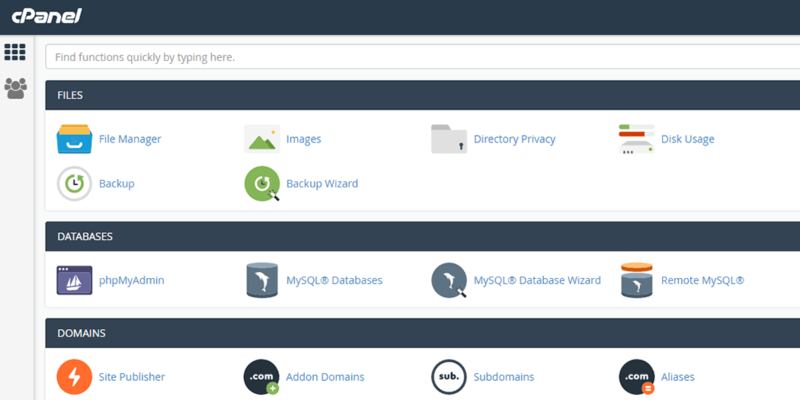 cPanel even provides handy setup wizards, including MySQL Database Wizard and PostgreSQL Database Wizard, to help you get started. Which hosting software your provider uses might not seem like too big of a deal, but it can greatly affect your overall experience. After all, that software defines the ways in which you can interact with your server. What do you think about cPanel and its features? Share your thoughts with us in the comments section below!